Aaah, I'm so relieved! We've been on vacation in Montana visiting Billy's family for the last few weeks and Billy didn't want me to post anything anywhere about our stay until it was over. While he's only being practical (Because of the would be burglars that peruse social media looking for homes to hit. We have a couple stay at the house while we're gone, but thoughtful Billy didn't want anyone who may be thinking that the house was empty breaking into the house while they were there. ), I've been antsy just waiting to post my photos not only here but on Facebook and Instagram. I would get so excited to post every photo that I took of the amazing scenery and the animals that come right into the back yard to Instagram, and I couldn't post them:( I mean the whole fun of Instagram is that it's instant; it's not TwoWeeksAgogram. Well I guess it's better later than never, so be prepared for a barrage of Montana pictures and stories in the next little bit! 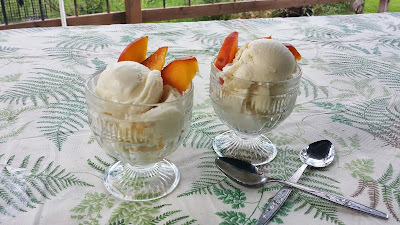 So Montana was having a heat wave while we there, (which is perfect for me the visiting Floridian, cuz the only way I'm getting into the water is if I'm really warm), a heat wave definitely calls for evenings on the deck, looking out at the river, eating a nice cool treat. Frozen yogurt is a great cool treat because it's not too sweet, and much lower in fat than ice cream. 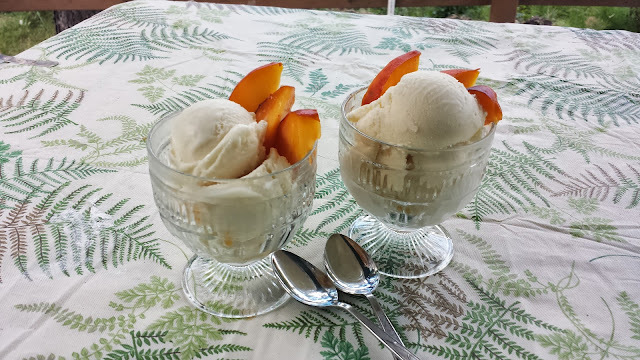 This recipe uses thick Greek yogurt, which gives the frozen yogurt a really nice creamy consistency and has tartness and tang as well. I used full fat Greek yogurt as well as half & half for the body of the froyo; you may choose to use low-fat or fat-free Greek yogurt, but the half & half is necessary to get a creamy product, if milk is used the froyo will be grainy. I don't have an ice cream machine and if I were to just to put the yogurt straight into the freezer it would just freeze into a block and it wouldn't be scoopable. An ice cream machine stirs the mixture while it freezes so it breaks up the ice crystals and incorporates a little air into the froyo. I came up a method that mimics what the ice cream machine does so that the frozen yogurt is creamy and scoopable. 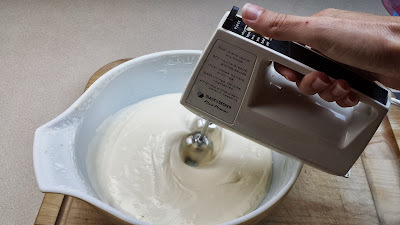 If you do have an ice cream maker, you will just mix all the ingredients together and then use your machine according to the manufacturer's directions. In Honey Vanilla Frozen Yogurt the honey and vanilla flavors are definitely prominent, but honey and vanilla goes with so many other flavors; so go ahead and serve it with any fruit or berries and it's even yummy on top of a brownie, or fruit crisp! Right in the middle of making the froyo Billy came running in the house yelling, "Holy crap! What is that?" 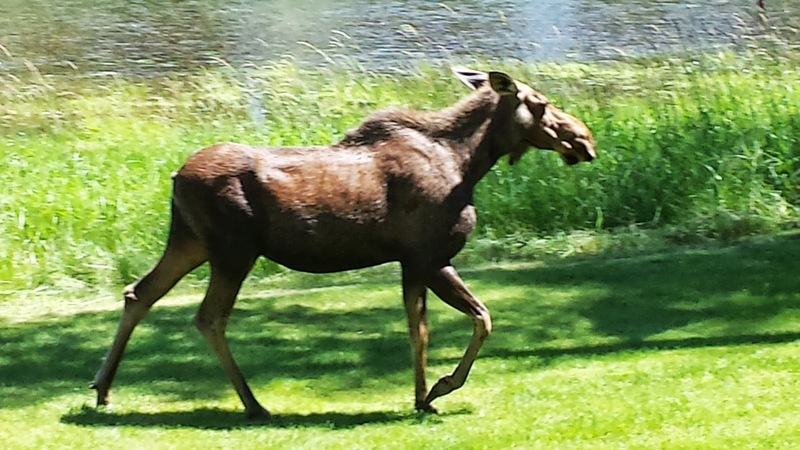 Well directly in front of him was a moose that came for a snack of leaves. 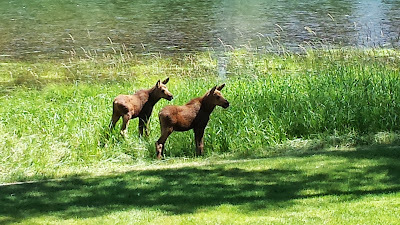 We've never seen a moose in the summer, they like cooler temps so they're usually up higher in the mountains. Mama Moose had her twins with her. It's really baffling that she wasn't bothered at all by us snapping a gazillion pictures of her and her babies; it's not uncommon for moose to be aggressive. I used these yummy local dairy products! These products contain no extraneous ingredients; the half and half is milk and cream, that's it! Because there are only four ingredients, you can really taste each and every one of them so it's important to use good ingredients. ...and honey. Give it a good mix. Pour the half & half into a large glass or ceramic bowl. Beat the half & half on high speed for about 8 minutes until it's frothy and thick. Keep the half & half good and cold until you're ready to beat it; it also helps to put the bowl in the refrigerator for a few minutes. 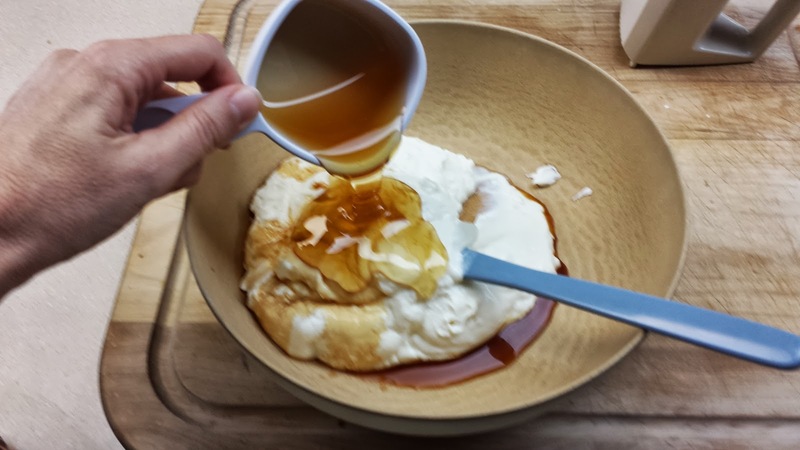 Pour the yogurt mixture into the beaten half & half. Mix it with the beater to incorporate. 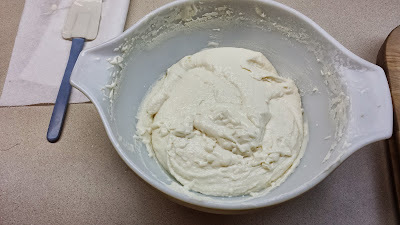 Put the yogurt mixture into the freezer for 45 minutes. Remove the bowl and mix on medium speed, being sure to scrape the sides of the bowl; this breaks up the ice crystals yielding a creamy end product. 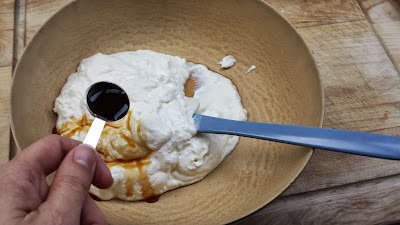 Return the yogurt to the freezer for another 45 minutes and then repeat the process. Now repeat the process 4 more times, but at 30 minutes intervals. 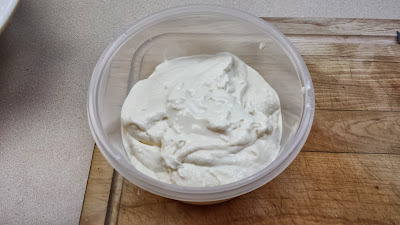 This is what the yogurt looks like when it's ready to remove from the glass bowl. It's still soft but not loose. Transfer the froyo to a plastic bowl that has a lid. Place this in the freezer for a couple of hours. You may enjoy this tangy, sweet and creamy frozen yogurt all by its lonesome, but the lovely vanilla, honey flavor is perfectly paired with sliced fruit or berries! 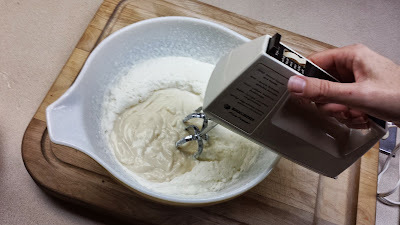 If you have an ice cream machine: Whisk together all of the ingredients in a large bowl, now use your ice cream machine according to the manufacturer's directions. If you don’t have an ice cream machine follow these directions for creamy frozen yogurt. 1. In a medium bowl mix together the Greek yogurt, honey and vanilla extract. 2. Pour the half & half into a large glass or ceramic bowl. 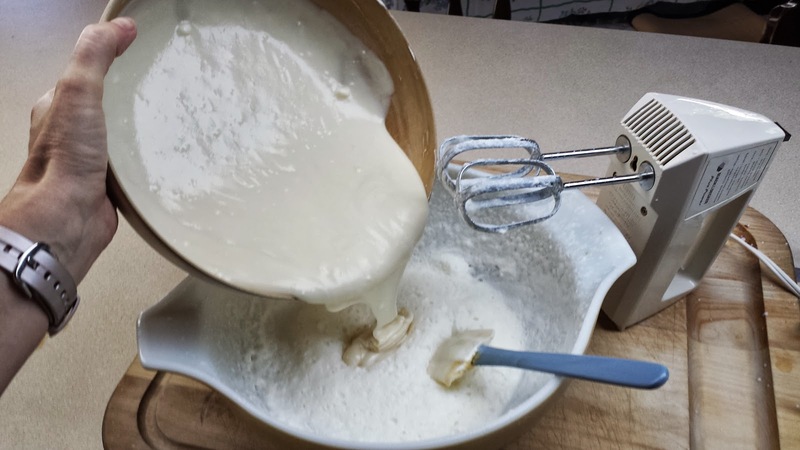 Beat the half & half with a handheld mixer on high speed until thick and frothy, about 8 minutes; the half & half must be cold, it also helps to put the bowl and beaters into the freezer for a few minutes(it will get about half as thick as if you were beating heavy cream). 3. 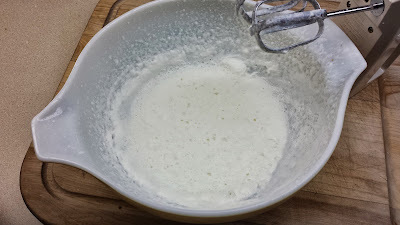 Pour the yogurt mixture into the whipped half & half and beat with the mixer until completely combined. 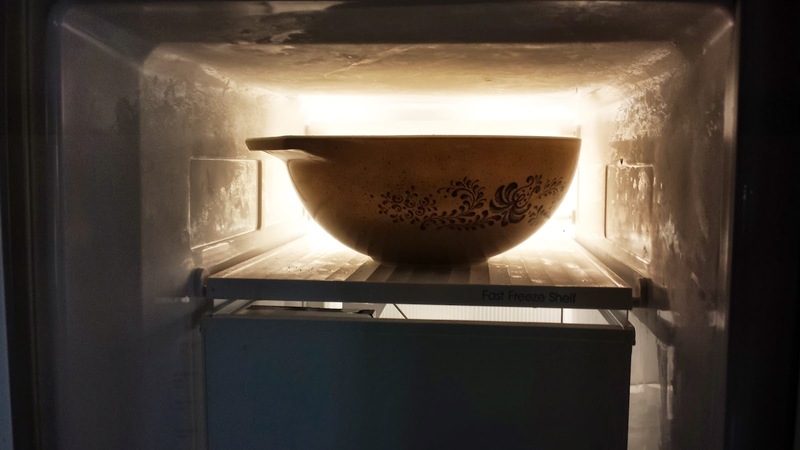 Place the entire bowl and its contents into the freezer. 4. After the yogurt has been in the freezer for 45 minutes, remove the bowl of yogurt from the freezer and mix completely with the handheld mixer on medium- high speed being sure to scrape the sides of the bowl (this breaks up the ice crystals so that the froyo will have a smooth consistency); return to the freezer for another 45 minutes, and repeat. Now mix the yogurt every 30 minutes, returning the bowl of yogurt to the freezer each time; do this 4 times. 5. After the final mix, remove the frozen yogurt from the glass (or ceramic bowl) to a plastic container that has a lid and freeze until firm. Serve Honey Vanilla Frozen Yogurt with sliced fruit or berries. This sounds delicious! Love the moose photos - can't wait to see more. I would love a trip to Montana. To eat frozen yogurt of course! 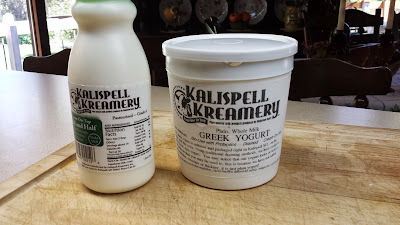 The Greek yogurt is fantastic, all natural is definitely the best. Love this healthy, yummy yogurt ice cream. Haha sounds like my husband !! Yummm your froyo came out perfect! Nice recipe. more i can say is Creamy, healthy and delicious. Thanks a lot for sharing.